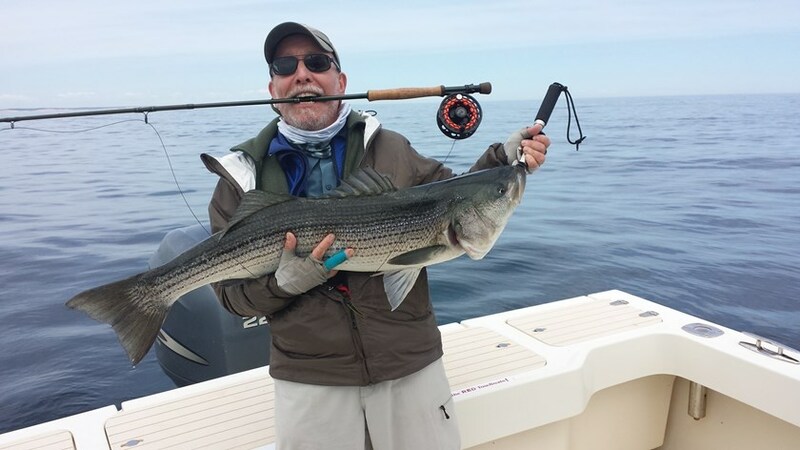 We specialize in light tackle fishing for striped bass, bluefish and tuna. Fishing the flats, Rips, or the backside, our custom tied flies, top water plugs, jigs or baits, we have what it takes to get the job done. Professional, guided fishing trips. We provide the newest and highest quality gear for spin fishing or fly fishing. We are able to move our boats from the dock at Oyster river in Chatham, to Barnstable Harbor, Sesuit Harbor, Brewster flats, Wellfleet out to Billingsgate, Pamet River in Truro, all the way to Provincetown Race and the backside. Leaving from our dock at Oyster river or from Ryders Cove, Chatham, we fish Nantucket Sound, Monomoy, and up the backside off Orleans' Nauset and the Eastham National Seashore beaches. Unique bait migrations around Cape Cod, squid, herring, mackerel, crabs, shrimp, and sand eels allow us to use a variety of gear and methods. We supply all the tackle necessary to hook these powerful game fish. Come join us for the chance to land the fish of a lifetime with fly or light tackle. These exciting trips are in high demand. Please call (508) 237-0785 for available 2016 dates.